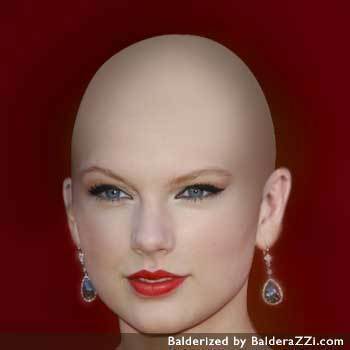 Taylor schnell, swift bald?!. I nearly died! She better not pull a Britney Spears/Megan Fox!. Wallpaper and background images in the Taylor schnell, swift club tagged: taylor swift bald. They just balded her in the picture. She still has hair. um,guys? it says in big print on the bottom right-hand corner of the picture that this was done artificially on a website. those words are kinda hard to miss...? Silly, silly people. It's been photoshoped. Taylor would be bonkers if she went bald. you know what, that ain t funny so don t be laughing at the cauncer people !!!!!!!!!!!!!!!!!!!!!!! I can't believe someone would do that. I hate it when people edit celeb pictures and make them look like a joke. It's mean and cruel. Sure, there are a few celebrities out there who I don't care to look at or listen too but I wouldn't be an immature twit and do something like that.